Make sure your Wi-Fi printer is connected to your local network. Network configuration depends on the brand and model of your printer so we can’t go into that in this tip. If you need help connecting your printer to your network feel free to give us a call. 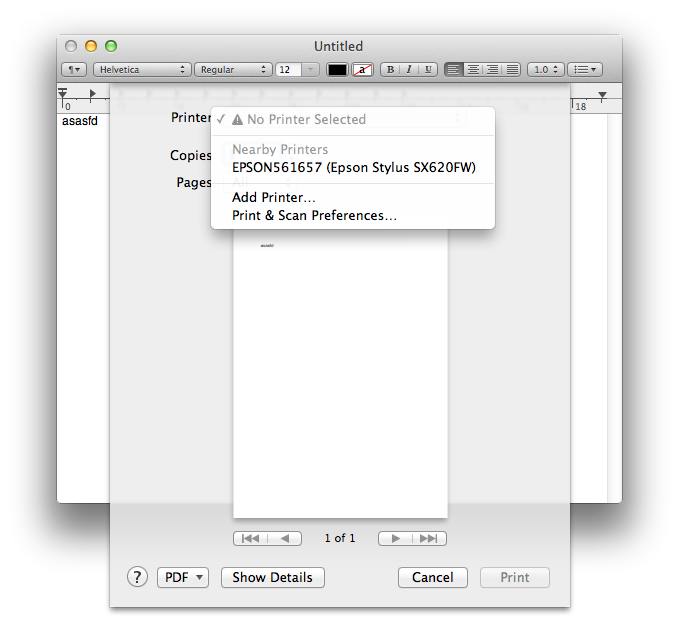 Once your printer is connected to the network, open any application that can print (such as: TextEdit or Pages). Create a new document and enter some random characters in your newly created document. In the menu bar at the top of the screen click on ‘File’ and then on ‘Print’. A new window will open. This window will show a selection option next to the word ‘Printer’. Click this and your printer should be listed under ‘Nearby printers’. Click on your printer and it will be installed. If a printer of this brand wasn’t used before on your Mac it will automatically download the required software from Apple an install it for you. This might take some time depending on the speed of your internet connection. This should be everything you need to do to install a Wi-Fi printer on OS X. Sometimes older drivers that are still installed might cause issues. If this is the case please feel free to give us a call and we’ll gladly help you to resolve any problems you might have. 2019 © MacGuruPro | All rights reserved.